Product code: ES677cc Categories: Sold Items, Sold Rings. Australia is home to the best quality opals in the world and Lightning Ridge in north west New South Wales Australia is regarded as the source of simply the best of the best opals – the world famous Lightning Ridge black opal. And here we have a spectacular solid Lightning Ridge black opal that is breathtaking to look at. Set into an 18ct white gold setting, the opal is flanked on each side by three Princess cut diamonds in such an elegant setting. These diamonds total 1.20 carats and compliment the solid opal so well. However the real star of the show is the magnificent black opal in the centre. This opal has so much fire and life to it and really shows why Lightning Ridge opals are regarded as the best of the best. The setting from the end of one diamond across to the other side measures 20.8mm across by 16.5mm wide at the opal. 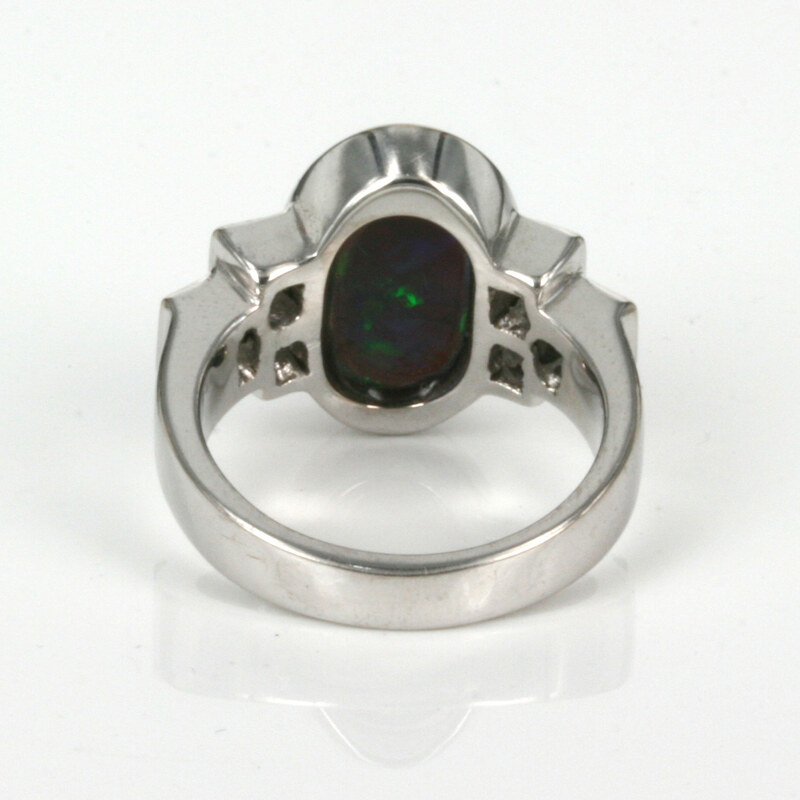 Being bezel set also means that the opal is well protected and gives this ring such a nice clean look to it. This is a fabulous solid black opal and diamond ring that will have you admiring it every single time that it is worn and is sure to be admired by so many at the same time.